Oscar Olivares talks about the working conditions at his former employer, the Little Village car wash, where the only money he made was from his tips. The owner of the car wash did not return calls left Thursday by The Chicago Reporter. Photo by Lucio Villa. On a bad day Oscar Olivares earns $5 a day in tips working as a car washer, a good day can get him $55, but most of the time the pay is somewhere in between and that's his only income for that day. The 45-year-old Salvadorian immigrant has been working in this industry for eight years and as far as he’s concerned, all of the car washers in the city pay the same. "There were days that I didn't earn a penny," he said at a news conference Thursday. "During winter the boss asked us to clean the parking lot without paying us." A new study conducted by the University of Illinois shows Olivares’ experience in the car washing industry is not unique. In fact, 75 percent of the workers surveyed earn below minimum wage and almost 20 percent of these workers were forced to work only for tips, like Olivares. Nearly all of the workers were not paid over time. All these violations of the Fair Labor Standards Act, including not paying the state's minimum wage of $8.25 or overtime compensation, resulted in an average of $4,413.24 in stolen wages to each worker annually, according to the study. The study also found that these workers live in poverty and face hazardous conditions, including rashes, cuts, nausea and other types of injuries. The car wash study includes surveys of 204 workers in 57 car washes in Chicago -- which accounts for 70 percent of the entire industry in the city. 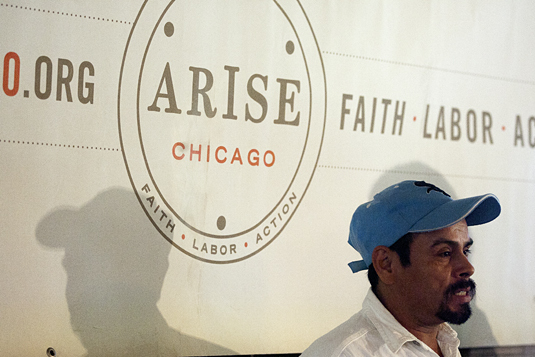 Bruno started working on the study after Arise Chicago Worker Center contacted him, when the nonprofit saw a pattern. Labor activists at Arise saw that many car wash workers were not being paid minimum wage, overtime and some were being forced to work only for tips. Olivares said car wash owners exploit the workers because the owners know most of them are undocumented. “They don’t ask for papers. It's sad and unjust but what can we do?” he said in Spanish. “They stomp on us because we don’t have papers." Olivares came to the United States in 1996 after feeling the civil war in El Salvador. He had been a soldier back home and his mother pleaded with him to leave the country before something bad happened to him, he said. He received a Temporary Protected Status from the U.S. government but he lost his documents and couldn’t afford to reapply for TPS, he said. He works all year long at car washes, meaning he faces Chicago's harsh winters and scortching summers. Car wash is very important for cars as dirty car can spoil the paint and sometimes engine too. Car wash can be done yourself also as sometimes it happens that service center charges more for the wash. As we know that water is very precious so we try to save water and we should better wash the car by a car wash liquid. It will save water and money also.